Disposable single-use metal blades, crescent knife, 2.2mm, bevel up, 45-degree angled tip. 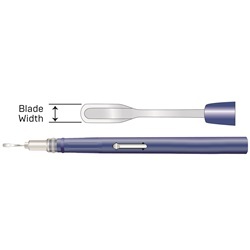 Blue handle with smooth, single handed blade retraction. Packaged individually, sterile. Sold 6 per box.